Warning: Before you read, this article does contain two disturbing pictures of animals being shut in cramped, small cages. If you want skip these pictures, you can scroll down if you wish. Animals. Who doesn’t love them? I know I certainly do – I’ve grown up with two, care free border collies and five cats. But, what about animals outside the home? The ones you’ll see at the zoo? Are they being treated fairly and equally like our household best friends? To investigate and answer this question, I’ve teamed up with theveganlily to address this issue, to explain how and why animals are still treated badly in captivity. Growing up, I’ve always had a huge passion for animals; I loved learning about and talking to them. In the UK (where I live), most zoos claim that they provide excellent care to our animal friends; big or small. But when I read one of theveganlily’s articles about the abuse of farm animals, I was inspired to dig a little deeper. So, I wasted no time and began to start my research on animals – zoo animals to be exact. What I’ve found is shocking and disgusting. There are currently over 10,000 zoos in the world. They are meant to be fun, educational and a safe haven for all animals. However, not all zoo’s keep their problems. Some of the world’s beautiful, mighty and magnificent are imprisoned, abused, and even murdered by their keepers. So, what’s going on and why is this happening? Some zoos aboard (including some parts of the Western world) are torturing nature’s creatures, much to the distress of animal lovers everywhere. They ignore warnings and animal acts just because they couldn’t give a monkey’s out of it. 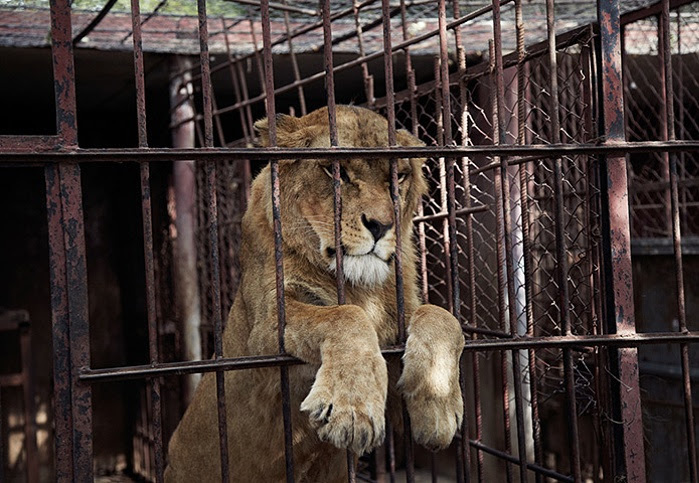 In some cases, there’ve been a hanging, involving a young lion, a tiger being fed with formaldehyde in its meat, replacing real animals with taxidermy models, keeping them in cramped, and dirty cages, in solitary confinement and with no exercise. Even theme parks have done a pretty bad job of taking care of them. Take SeaWorld for example. Not only do they have keep their whales and dolphins in shallow tanks the size of bathtubs (which are forty feet deep), the keepers physically and emotionally abuse them. This includes covering the animals’ sunburns with black zinc oxide, training whales to float on their backs before artificially inseminating and masturbating them; which forces them to breed earlier than usual. 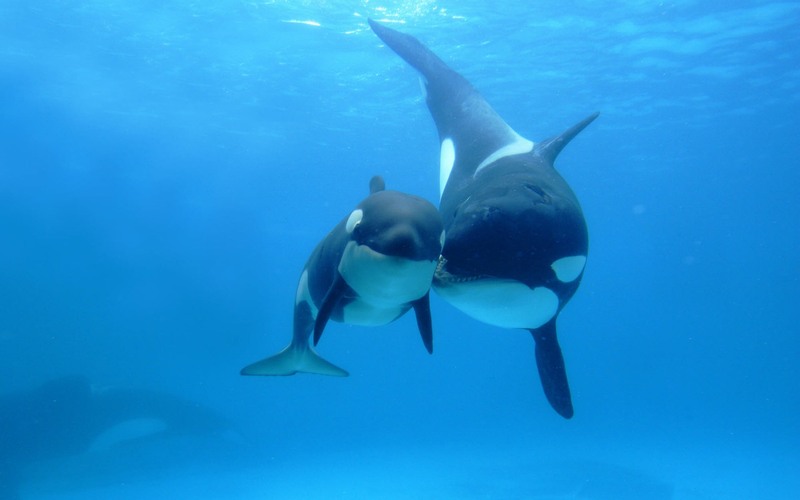 In one case, SeaWorld allow one of their female killer whales to inbred – with her own sons! Because of these barbarian acts, SeaWorld have failed to recognise how much they care for their animals; even the whales know that they are being treated unfairly. And do you want to know the worst part? That SeaWorld kidnaps them! Yes, SeaWorld kidnaps Orcas from the wild, before sending them to captivity. The signs are all there – the collapsed dorsal fins (which indicates an unhealthy and unhappy orca), the reported deaths of trainers. But it’s just Orcas that are getting bad treatment. In 2010, SeaWorld San Antonio allowed their female Sealion, Singer to drown in the drain in a holding pool, since the keepers did not properly drain the cover “tightly enough”. This is really appalling as I suspect that all the trainers’ have done a crappy job of taking care of them. And why, may I ask? It’s because of the real profession of SeaWorld’s trainers’ are performers instead of keepers. As a vegan animal rights activist, I have made the simple life decision of not contributing to the exploitation or captivity of any animal to the best of my ability. This, for me, means boycotting zoos. I find it difficult to look at an en-caged animal and believe that he or she deserves to be locked up and on display for the public. If I were to visit a zoo I would effectively be funding and supporting the captivity of many animals who, in my opinion, deserve better. The sad reality is the fact that zoos are unable to provide the same amount of space that their natural habitat would provide. Especially for animals such as tigers and giraffes (large animals) who would have around 18,000 times more space in the wild. Even at the best of zoos, the animals’ natural habitats cannot be compared to the enclosures provided. The animals are often prevented from doing natural and important actions such as flying, roaming, running, climbing, choosing a partner and foraging. Instead, these animals are often seen cramped, bored and lonely. I also question whether zoos exist for the well-being of these animals or simply for our entertainment. It seems unnatural and unnecessary to keep so many animals in unnatural enclosures. I don’t understand how we justify captivating certain animals whose specie isn’t even endangered. And it’s sad to think that the only reason so many species are becoming endangered and extinct is because of us, humans. A very touching and powerful video I would recommend watching is titled ”No Place Like Home”. The video explains in more depth some of the points I mentioned above. 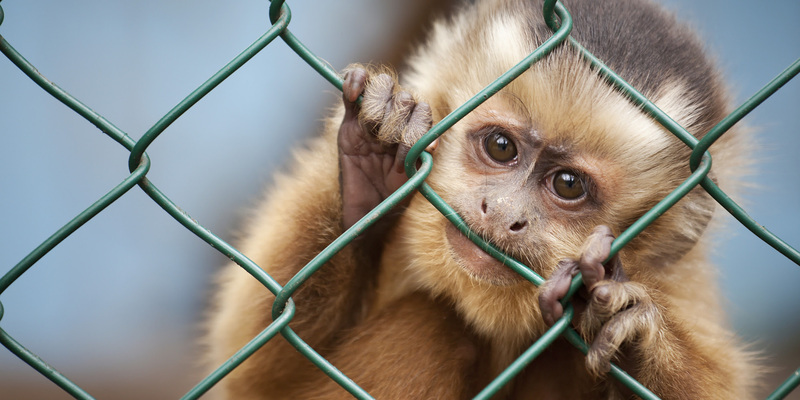 Zoos teach humans that it’s acceptable to interfere with animals and claim them as our own. This attitude being passed down from generation to generation is harmful for the animals for obvious reasons. I think that it’s incredibly important for us to educate ourselves as much as we can about issues regarding animal rights and welfare, simply because non-human animals are the most abused, exploited and tortured group of beings on this planet. We need to inform ourselves on how we can take action in stopping this exploitation and I believe that begins with ending our contribution and support to the abuse. The animals may not have voices, but we do and it’s time we put them to use. Boycotting zoo’s, aquariums and amusement parks, such as SeaWorld can be a dangerous crime. Growing up, I’ve seen zoo’s in London and Hertfordshire were animals are enclosed in small enclosures that are about the sizes of squares or wide, but cramped rectangles. In ZSL Whipsnade Zoo, I’ve seen many animals outside, roaming free in the outdoors (the zoo is actually on top of a hill, in the middle of the countryside) and some of them perform displays were visitors are not only entertained but taught about the species’ lives and how the conversation is saving them from extinction. But is this enough? Can more tourist attractions follow the example of Whipsnade? Do Whipsnade need to put more effort to meet the requirement standards for the comfort of the animals? Should places like SeaWorld be forced to close down when they don’t meet the full standards? Should world leaders pull forward harsher punishments? Join the debate; please share your opinions in the comments section below. Many thanks to theveganlily for her thoughts and the participation in this special article. P.S. If you still have time and you don’t agree with SeaWorld’s ways that they keep Orcas and breeding them, please sign this petition. I haven’t organised this petition, but I’ve already signed my name on this. I hope that you’ll make a difference and help more animals being realised back to the wild and/or treated fairly in zoo’s, theme parks and aquariums everywhere. bahaha what a joke. Let’s look at this with some logic and common sense. “Take SeaWorld for example. Not only do they have keep their whales and dolphins in shallow tanks the size of bathtubs (which are forty feet deep), the keepers physically and emotionally abuse them. This includes covering the animals’ sunburns with black zinc oxide, training whales to float on their backs before artificially inseminating and masturbating them; which forces them to breed earlier than usual. In one case, SeaWorld allow one of their female killer whales to inbred – with her own sons! Because of these barbarian acts, SeaWorld have failed to recognise how much they care for their animals; even the whales know that they are being treated unfairly. And do you want to know the worst part? That SeaWorld kidnaps them! Yes, SeaWorld kidnaps Orcas from the wild, before sending them to captivity. First of all, how are 40 foot deep tanks shallow? How are 5,000,000-7,000,000 gallon stadium complexes bathtubs? I can’t swim in my bathtub (I wish I could!) Additionally, SeaWorld is planning to expand their tanks. It’s called the Blue World Project. Look it up. You know how many orcas were bred through artificial insemination at all marine parks? Here’s a list: http://orcapod.wikia.com/wiki/Category:Natural_Conception_Vs._Artificial_Insemination There have been 96 captive births, only 6 of the orcas were conceived through AI. That’s 6.25% – not even a quarter. Not even 10%. “SeaWorld kidnaps them! Yes, SeaWorld kidnaps Orcas”. No. The last orcas that SeaWorld “kidnapped” were Katina and Kasatka in 1978 – 37 years ago. It’s not something that happens anymore, luckily. As for it meaning that the animals are unhappy, the animals can’t move their dorsal fins around. There are no muscles or bones in dorsal fins. It’s not an indicator of their happiness. Most scientists on both sides of the debate think collapsed dorsals are caused by gravity. Captive orcas spend more time near the surface. It’s not an indicator of welfare. The animals probably don’t even know their fins are collapsed. Might want to do more research next time! Pointer #1: I’ve heard stories of SeaWorld through loved ones, as we all animal lovers. I even went to a SeaWorld attraction in Canada, where we saw, face-to-face, how Orcas were being cruelly treated. In small show tanks. Pointer #2: I’ve signed a petition (which the description link is at the bottom) and once a month, I’ve been receiving emails from the campaigner that gives regular updates of the campaign. Not all the news is good though. Pointer #3: I’ve done a fair amount of research, just like all of my articles. In all honesty, I would never write ‘make believe’ or conspiracy theories. Never in my life because writing them is a complete waste of time. Pointer #4: The websites I’ve researched are valid and honest. I even checked the small print myself. It’s a better way to go than using Wikipedia all the time because most of the information is better bogus. On another point, I don’t really buy SeaWorld’s decision on getting new sea tanks for the Ocras. Do they have the money for it? Are they going to keep their promises – to treat their animals fairly and stop all the negativity happening behind the scenes and while their performing? Those are important questions to keep in mind because I don’t think that’s actually going to happen. Even television has pointed SeaWorld’s negativity out in a TV documentary called ‘Blackfish’. This focuses all of this after one the keepers died, being eaten by one of the Ocras. Pointer #5: The humans. Now, let’s think on this one. How many humans would process greed over love? How many would choose cruelty to animals rather than caring for them? How many would choose harming animals for life by following the example of others? There are so many humans who are choosing it right now, even ones who aren’t poachers, or locking animals in small, cramped cages in zoo’s and amusement parks. Reblogged this on The Vegan Lily.